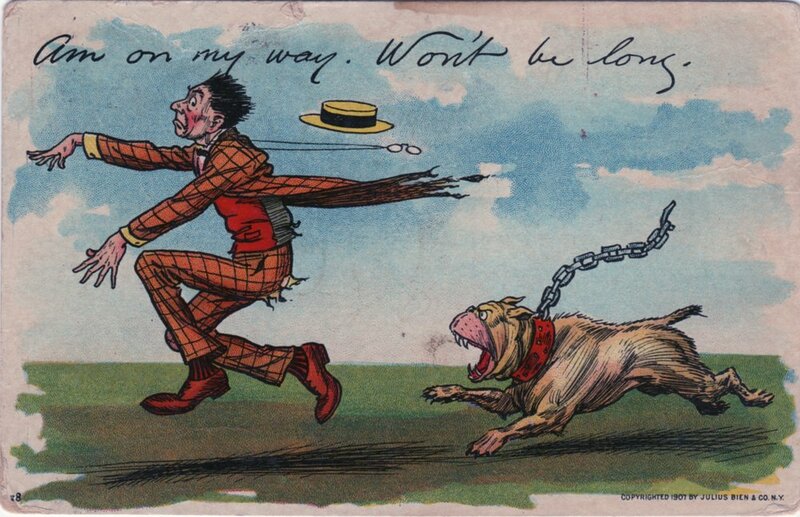 This week we have a lovely, slightly bizarre, 100 year old postcard. As you'll see it depicts an angry looking dog chasing a scared man in an ugly orange suit. The message, "Am on my way. Won't be long" appears to suggest that the writer will soon reunite with the recipient. The postcard is addressed to a "Mr. I.S. Jordan" of Ava, Ohio and has a postmark of 1908. It appears to be sent from Byesville, Ohio and received in Ava. A quick google map search shows us that Ava is only about 12 miles south of Byesville. Both cities are almost directly East of Columbus, OH. I was at Homers yesterday. They have a girl. She came Sat night. You let Clara and Hannah know. You can telephone to Marion he will see H - Ira is getting along fine. Sit up a few minutes yesterday come up and see us. A VERY quick search on ancestry.com leads me to believe that the sender is an Ida May Jordan (later Province). 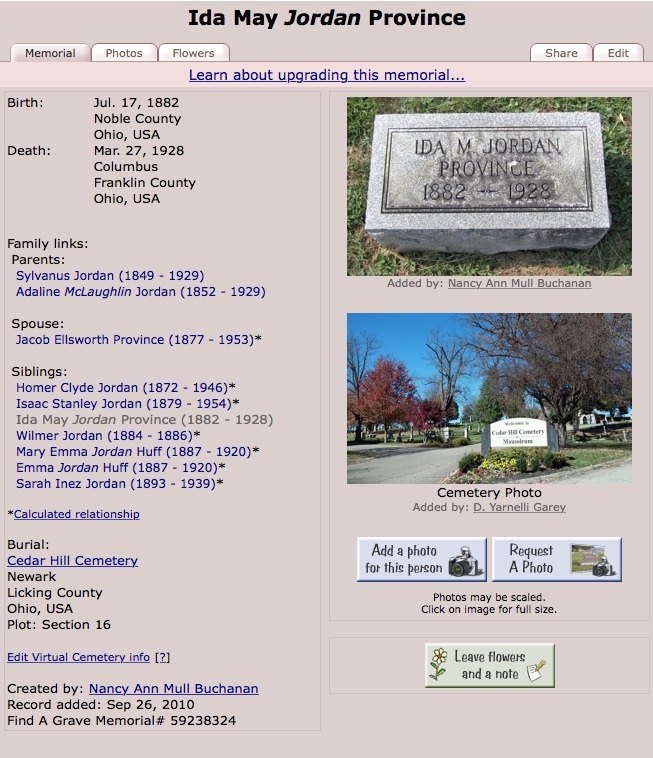 Her Find a Grave memorial entry says she was born on July 17, 1882 and died on March 27, 1928. Ida is visiting her older brother, Homer, who just had a baby girl with his wife. She is writing to her other older brother, Isaac Stanley (i.e., "I.S. "), to tell him the good news and give instructions as to who to call. She is also asking him to pass the news along to some as of yet unidentified people, Clara and Hannah. These don't appear to be siblings of the two, but perhaps family of Isaac's. A census search for Isaac shows no obvious Clara or Hannah, so perhaps these are some more distant relatives or family friends. I imagine the Jordans to be a fun loving and supportive family. The front of the card tells me they appreciate humor. Who are Marion, Clara, and Hannah? Is there anyone alive today who would have a personal connection to this postcard? If so, can you help me find them? What is the oldest piece of correspondence you have in your possession right now (e.g., letter, postcard) and what does it tell you about your family's history.